If you have dreaded cellulite that won’t budge, no matter what you try, then Skin Tech Clinic can help with Shockwave. 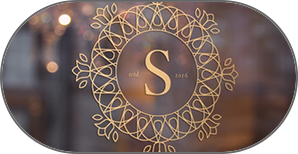 Our award-winning, latest 3D Lipo Shockwave technology helps you visibly and drastically smooth out your cellulite with a course of treatments. In some cases, it is completely eliminated in that area. The shockwave energy is very focused and the pressure encourages the breakdown of hard fibrous cellulite. The mechanical effect of the shockwave means that the connective tissue in the area is mobilised and flexed and so will loosen but also strengthen as shown in the diagram below. 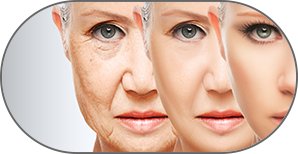 Elastin also becomes denser and so this improves skin flexibility and firmness. Shockwave increases blood flow to the area due to the high pressure of the treatment. This increased blood flow increases the size of the existing blood vessels as well as encouraging the creation of new ones (Neovascularisation). Better blood flow increases nutrients and oxygen to the area and so has long-term benefits in many ways. The vibration from the shockwave transfers to the muscles, resulting in the muscles resisting and contracting creating a toning effect similar to that of a power plate. helps lymphatic drainage for removal of broken down fats to drain away in the lymph to be processed out of the body. 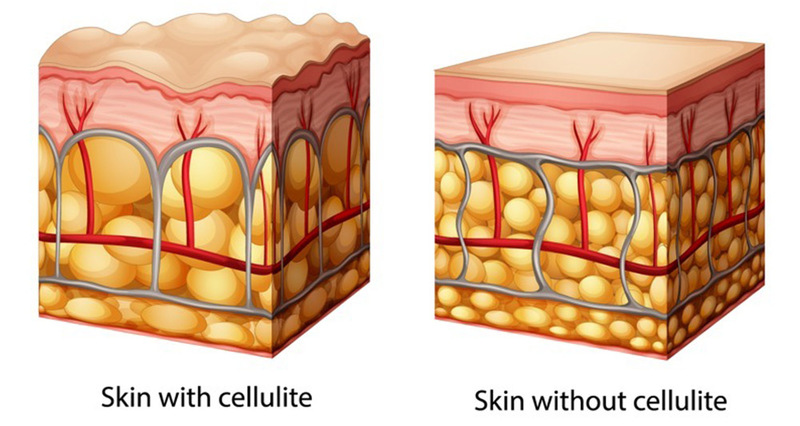 Cellulite is much more common in women due to the difference in the way our collagen and elastin fibres are structured. A combination of all these would certainly help over time and you should do what you can to help your body in these positive ways. A pulsating strong massage from the device applicator head – see photo. It has been described as not painful but only occasionally uncomfortable. The area will look red due to increased blood flow. Occasionally there may be bruising but these bruises will be very small. Results are seen immediately and improve over the next 2-3 weeks. These treatments build on themselves and you will see improvements each time. Results will be permanent or long-lasting as long as you maintain a healthy lifestyle and exercise. 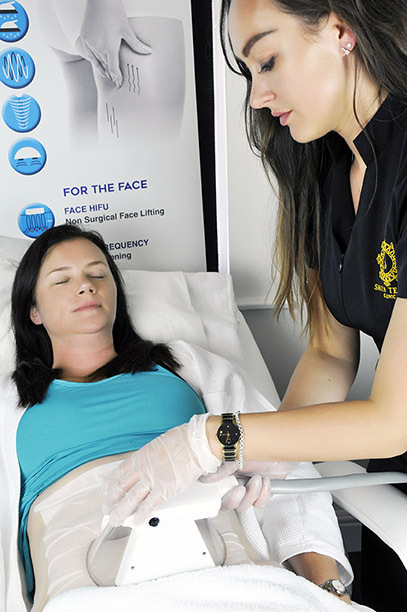 It is good to see shockwave therapy as part of a bigger picture, where you are committed to becoming healthier, have good diet, don’t drink regularly to excess and take some regular exercise as well as ensuring your body is well hydrated to ensure cellulite is kept at bay but you can have more than one course of treatments in the year. Is Shockwave suitable for me? Most people can be treated with Shockwave therapy but we always recommend you have a consultation with a trained and experienced practitioner to discuss your concerns, expectations and medical background. You may have other areas of concern such as loose skin or cellulite, which we can also work on. This will be discussed at consultation to make sure all your concerns are being treated. Metal implant in the area. Exercise for 30 mins 2-3 times a week. 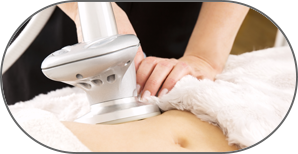 We offer shockwave therapy either as a stand-alone treatment for eliminating cellulite or most commonly alongside inch loss Ultrasound Cavitation. The following price table shows cellulite treatment prices for shockwave therapy only. For Prices with cavitation with inch loss – please see Ultrasound cavitation page where shockwave is included in the price. 10-30 minutes if used alone. Swelling, some small mild bruises may or may not appear.